Spirit caramel: friend or foe? Adding E150a – spirit caramel in common parlance – to Scotch whisky is commonplace, but it remains a hugely controversial issue. Does it aid colour consistency and reassure consumers? Or does its ‘fake tan’ status con them? Tom Bruce-Gardyne reports. 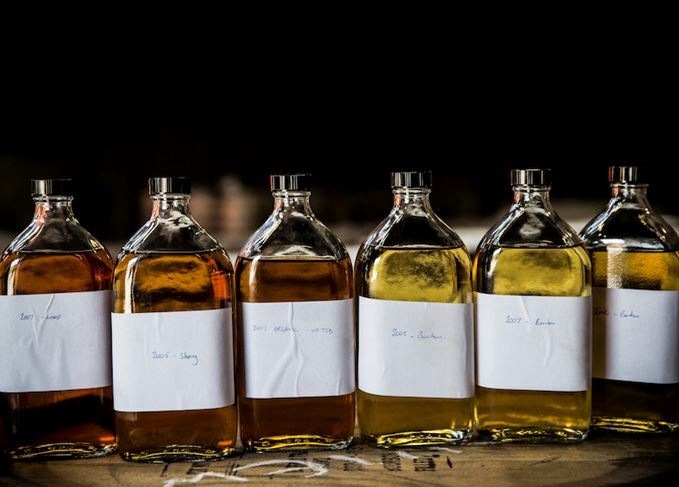 When whisky varies in colour from batch to batch like these samples, E150a can be added to aid consistency. ‘This one could run and run,’ wrote Dave Broom after dipping his pen in the great spirit caramel debate for the first time, back in 2001. Well, he can say that again. Fifteen years on, it’s still running, and if anything the opposing camps have become more entrenched. Is the use of caramel, or E150a, simply about offering a consistent colour, or is there a darker motive at play? If we buy with our eyes, a pallid three-year-old whisky from an exhausted, third-fill cask will look infinitely more appealing if tinted up to a rich mahogany, suggesting age and possibly some Sherry influence. It’s the fake tan syndrome, if you like, and it would be fascinating to see popular blends in their naked, unadorned state. Meanwhile, those marketing single malts need to retain our trust if they are going to abandon age statements. The colour-coded approach of Macallan – be it Gold, Amber or whatever – only works in the absence of E150a. But, compared to the French, the Scots are paragons of virtue when it comes to caramel addition, as Nick Morgan points out below. So here’s the big question: spirit caramel – innocent additive or guilty of deception? ‘There are certain fundamental principles that we simply never compromise over here at Bruichladdich, and ‘‘no caramel” is one of them because we are great believers in the concept of “natural whisky”. ‘Caramel is essentially made by cooking sugar until it changes its chemical structure. There are those who argue that the taste of this cooked sugar is not detectable in Scotch, but we strongly dispute this. ‘Others in the industry add caramel for two reasons. The first is to artificially darken the spirit because people believe that if whisky is dark, it must mean that it is old. If caramel has been added, then this is obviously not the case. ‘We believe that, if you combine this with that other simplistic industry mantra, that “older whisky is always better than younger whisky”, then there is a significant risk that people will misinterpret what they are being offered. ‘The second reason that others add caramel is because they need whisky to appear “consistent” to their consumers. The argument is that whiskies that rely heavily on brand recognition need to always look and taste the same, whether they are purchased in Birmingham, Berlin or Bangkok. ‘Their problem is that, as whisky varies for a myriad different reasons (it is impossible to make it appear the same from batch to batch or from vatting to vatting), so it needs to be “equalised” by the addition of food colouring. ‘They are quite correct in this because whisky is a natural product that varies significantly. No two distillations are ever exactly the same, just as no two casks are ever exactly the same. ‘At Bruichladdich we would rather celebrate these differences than mask them by adding caramel. We prefer all the colour in our whisky to be derived from the cask in which it is matured. ‘One of the key reasons for Scotch whisky becoming (and remaining) the world’s favourite whisky was the ability of the large blending houses (like Johnnie Walker or White Horse Distillers) to deliver a consistent level of quality to drinkers around the world. ‘Quality, and consistency, is no less important today than it was 150 years ago, when the global reputation of Scotch was being established. Drinkers expect their favourite Scotch (whether it be a blended Scotch whisky or a single malt), to smell, taste and – yes – look the same – glass after glass, and bottle after bottle. It’s a measure of authenticity and product integrity. ‘Appearance, the colour of your Scotch in your glass, is of huge importance. That’s why, for generations, blenders have used spirit caramel, an entirely natural product, to even out the entirely predictable colour variations between different batches of whisky, a practice long enshrined in the Scotch Whisky Regulations. ‘Similar adjustments, though often on a bigger scale and intended to rectify taste consistency as well as colour, are both permitted and frequently practised by makers of Cognac, Armagnac and other spirits, including rum. ‘These may include not just spirit caramel, but also the tannic, oak-flavoured essence known as boisé to simulate ageing, and sugar syrup to even out the taste. None of those in Scotch! ‘A tiny and unrepresentative and self-consciously elitist group of vocal critics are apt to signal their “expert” credentials (oh dear, sorry!) by claiming obsessively that spirit caramel affects the taste of the final whisky in the bottle. ‘Only minute quantities of spirit caramel – carefully measured and adjusted to ensure the right colour “tint” is achieved – are added to our vast blending vats before bottling. ‘And it’s not without interest to note that, when some of these critics have put themselves to the test on this matter under vaguely scientific conditions, almost all of them have had to conclude that spirit caramel leaves no trace of taste in bottled whisky. Passionate arguments on both sides of the debate. Strongly held views, with plenty to back them up – but who’s right? Ultimately, this will remain a matter of personal opinion: do you back Hannett’s undiluted puritanism, and argue that Scotch whisky is a natural product that should not be monkeyed around with, no matter how minute the quantities of spirit caramel added may be? Or do you side with Dr Morgan’s pleas for E150a’s acquittal on all charges? Not only is it a boon to distillers wanting to give their loyal consumers a consistent product, he argues, but you can’t taste it anyway. Caramel in whisky: why is it there, what does it do and does it matter? The Whisky Prof on E150a. Are whisky regions still relevant? Do Scotland’s whisky regions help guide or confuse drinkers? Two voices argue their side.